Saturday was Armed Forces Day! A commonly cited statistic is that more than 700,000 children in America have at least one parent deployed in the United State armed forces. Children also have grandparents, aunts and uncles, sisters and brothers who have served or are currently serving. So, books about the armed forces are an important part of a school library collection. There are always a group of kids who want to read every book available about military units, military hardware, ships, aircraft and vehicles. Sets of books on these topics are a staple of many nonfiction publishers. The recent action of the U.S. Navy SEAL snipers against the hijackers of the Maersk Alabama highlighted the usually low key work of special forces. Bearport's Special Ops series focuses on the work of the Army Rangers, Green Berets, Navy Seals, Delta Force, Marine Force Recon and Pararescuemen. 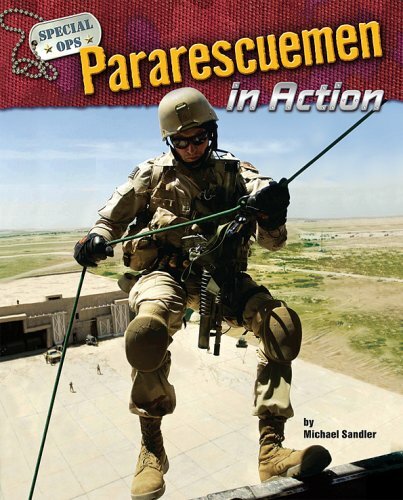 My review copy of Pararescuemen includes color photographs of pararescue jumpers training and living their motto: So others may live. The history of the PJs date back to WWII. In more recent times they have rescued the splashdown capsules of NASA space missions, survivors of Hurricane Katrina and personnel in Iraq and Afghanistan. A nice two page spread illustrates the "PJ's Gear." A glossary, index, bibliographpy and "read more" are also included. The book has a nice design and clear, easy-to-read typeface. I recommend this series for elementary school libraries. I can see boys who might not enjoy fiction loving this! It is really nicely designed and very accessible. The series should be very popular! Wow, thank you for reviewing this! You almost never see military-type books for kids reviewed, but they're in such high demand. Its good for kids to know what are the military do to serve and defend the country.